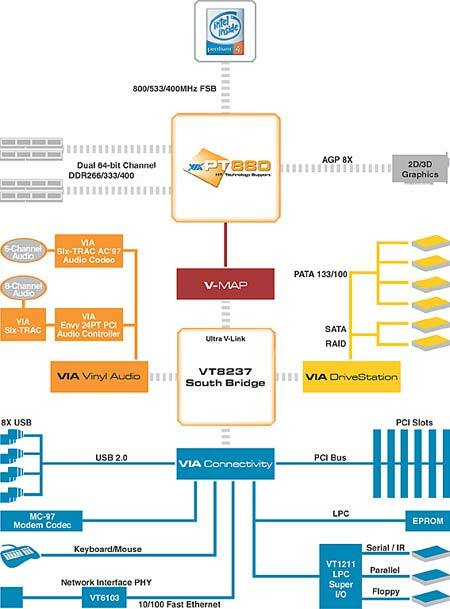 Maintaining its competitive edge over the price of an Intel i865PE chipset, the VIA PT880 dishes out system-level performance roughly on par with the Intel's i875P Canterwood. Much of this performance advantage is due to the PT880 being built from the ground up,instead of on the shoulders of some legacy core logic. The PT880 is the first VIA chipset in a long time that offers an Asynchronous bus between the memory and FSB, this means you can set the memory to run faster than the FSB. As you might have anticipated, the PT880 offers 8x AGP or 2.1GB/s of bandwidth between the videocard and the Northbridge, which should be fast enough for today's PC's. It's nice to see that the PT880 is compatible with all Pentium 4 processors, not just 800 MHz based ones. VIA are very proud of their DualStream64 memory controller, claiming that it offers enhanced data prefetch and vastly improved memory branch prediction. Unlike it's mainstream rival the Intel i865PE, VIA's PT880 chipset also supports ECC memory. ECC memory is typically deployed in the workstation environment, making this yet another viable alternative to Intel's i875P. To make the PT880 more enticing to workstation users, the PT880 will support as much as 8GB of DDR memory. The Intel i865PE/i875P support a maximum of just 4GB. Other than what we've mentioned, VIA were a bit vague on the specifics... but as you'll see from the upcoming benchmarks, they were right when they claimed the PT880 was fast!